Intel Extreme processors have been many wishlists for their ultimate performance and processing power, which can be attributed to the higher L3 cache and up to 12 threads. This is music to just about everyone’s ears since the Extreme counterparts such as IvyBridge and Haswell desktop processors max out at 8 threads. Although Haswell has been out for some time, the Haswell Extreme processors will not be here till mid-2014 at best. In Intel’s evolution, Haswell E is next on Intel’s list but it is still far off making SandyBridge and IvyBridge Extreme processors still a viable solution with a somewhat aging platform. As we all know, SandyBridge and IvyBridge E processors are based on the LGA 2011 interface and although Haswell Extreme will use the same socket, the X99 chipset is slated for it. As we see in Intel’s future, DDR4 is on the horizon here so this means the X79 chipset will soon be phased out to support the newer technology. 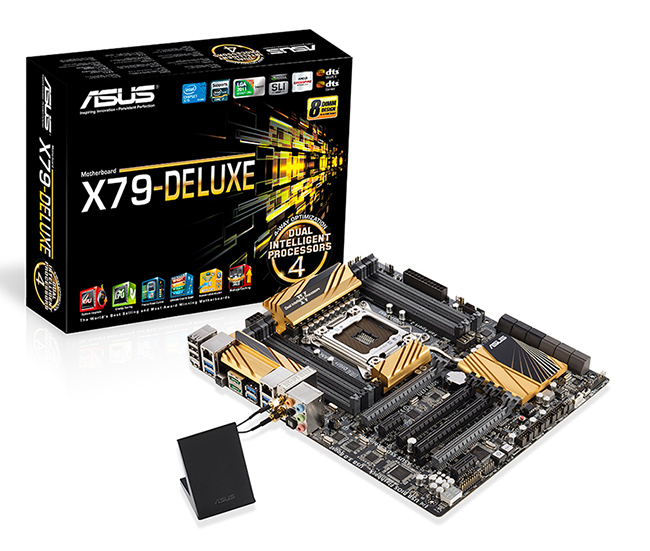 Today, we look at the Asus X79 Deluxe motherboard for Sandy and Ivy “E” processors. It is still a viable platform for higher end systems and workstations. Asus has evolved the X79 Deluxe from the original offerings in their P9 series which were great motherboards, but we see a refresh in aesthetics along with a boatload of added features. With much ado, let’s get the Asus X79 Deluxe on the test bench and see the prowess of the “Extreme” in action. ASUS continues to deliver on ourIn Search of Incredible promiseas we strive to become the world’s most admired leading enterprise in the new digital era. OurIn Search of Incrediblecampaign, launched in 2011, symbolizes ourDesign Thinking – Start with Peoplephilosophy. It extends beyond product design and development, sales and marketing, and illustrates the ASUS commitment to making life better through innovation. Let’s take a look at the X79 Chipset.